KYTHNOS, Greece -- This lesser-known island in the Cyclades, located three hours from Athens by ferry, looks more pastoral than high-tech. But while traveling here feels like a journey back through time, it offers a glimpse into a future of cleaner, cheaper and more reliable energy. In 2001, a humble microgrid was established on Kythnos at a site called Gaidouromantra, which means "donkey yard" in Greek. The small-scale, self-sufficient electrical grid is made up of seven distributed solar arrays dotted across a quaint little valley, where one homeowner spent his summer harvesting grapes to make wine. In this series, E&E examines the plight of the world's islands and island nations. They contributed very little to the changing climate from man-made greenhouse gas emissions, but some may pay with their lives. Click here to view the report. Completely cut off from the local utility, the 12 houses in Gaidouromantra rely on 11 kilowatts of photovoltaic solar power and a room full of lead acid batteries to keep their lights on. Despite its small scale, this has been the site of numerous breakthroughs in the delivery and storage of distributed renewable energy in an off-grid system. "It is strange. You wouldn't expect a project like this on such a quiet little area. But this is one of the first in the world," said Filippas Antonis, who owns a house in the valley. 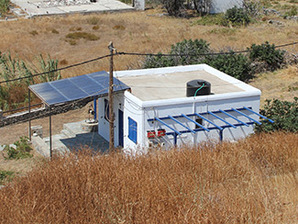 Stathis Tselepis, head of photovoltaic and distributed generation at the Greek government's Center for Renewable Energy Sources, has been working on the Kythnos microgrid since it was first proposed in 1997. On his most recent trip here, he made plans to replace the backup diesel generator, which broke down three years ago. Since then, the system has been successfully running entirely on solar power and energy storage. "I believe that microgrids will be one part of the puzzle in a whole new world of smart grids, which allow for a large penetration of renewable energy sources," Tselepis said as he tinkered with a solar panel. Microgrids can deliver significant benefits in terms of energy security, maximized network capacity, reduced energy costs and carbon dioxide emissions reductions. Ideally, if larger nations follow suit, they might even keep some islands above water. Kythnos has a long history of embracing renewable energy. In 1981, it became the site of Europe's first wind park, which is now a museum. In 1982, Kythnos became home to one of the largest solar arrays in Europe. However, today, like many islands, Kythnos runs primarily off diesel fuel. Over the years, Gaidouromantra has played host to three separate projects advancing the off-grid integration and management of renewable energy sources. This is where German solar energy equipment supplier SMA Solar Technology AG tested some of the first advanced bidirectional battery inverters designed to switch from alternating current to direct current and back again. These inverters are a central component of power supply systems for self-sustaining grid projects. 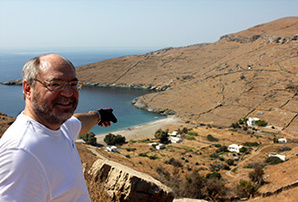 Stathis Tselepis points to houses on the solar-powered microgrid on the island of Kythnos. Photos by Julia Pyper. "Implementing distributed generation was generally based on the so-called connect-and-forget approach," said Aggelos Tsouchnikas, SMA's senior expert for power point solutions in Europe, the Middle East and Africa. "However, the Kythnos island small microgrid approach was completely different. Highly sophisticated algorithms for network security management were tested, showing that a shift from traditional central control philosophy to a new, more distributed control paradigm is actually possible." Technologies tested on Kythnos are now being integrated into larger microgrids around the world. Islands are especially eager to adopt renewable energy and build out small grid systems. High costs and vulnerability issues linked to diesel fuel are major drivers. For low-lying islands, the development of micogrid technology is also part of a battle for survival. "It's such an odd position for them because the carbon emissions that they're responsible for, in the global scheme of things, are trivial," said Peter Lilienthal, founder of Homer Energy, a distributed power design company and leader in microgrid software technology. "So it's not like they're going to solve the problem ... but islands desperately want the world to do something about [climate change], and they'll get the world's attention better if they can showcase their leadership position." A number of islands are now at the forefront of clean tech. Last year, at the U.N. Conference on Sustainable Development in Rio de Janeiro, the Carbon War Room launched the Ten Island Challenge, which aims to transition 10 islands from fossil fuels as part of a larger plan to catalyze $1 billion in private dollars toward carbon reductions. The Caribbean island of Aruba doesn't want to be known only for its powdery white sand and crystal clear water; it also wants to set the model for a low-carbon, sustainable and prosperous economy for all island nations. At the U.N. Conference on Sustainable Development in Rio de Janeiro last year, Prime Minister Mike Eman made the ambitious commitment to transition Aruba to 100 percent renewable energy by 2020. This goal is part of a larger "smart growth" plan for the island that also includes increasing housing choices, reducing traffic congestion, improving public health and diversifying economically. To embark on this project, Aruba partnered with the Carbon War Room (CWR), an organization that seeks to tackle climate change though market-driven solutions. In a new report, CWR created a road map outlining opportunities for Aruba to transform its energy sector from one that is dependent on fossil fuels to one that is fundamentally renewable. "The pathway suggests what's required is a systematic approach that finds the best combination of energy efficiency as well as renewable energy, storage, demand response and smart grid applications, as well as the interim use of things like biofuels to get to a high penetration," said Maya Doolub, operation leader for CWR's Smart Island Economies program. One of the projects already underway is a microgrid that will serve a neighborhood of 20 homes. The small-scale grid system will test smart metering technologies and possible demand response applications, as well as small wind turbines, rooftop solar arrays and local energy storage. According to CWR, there's an untapped opportunity to develop similar microgrid projects on a commercial level at Aruba's cruise ship or cargo port. Ultimately, Aruba's microgrid model could be scaled up and exported to other island nations. "I think that piece is very important," Doolub said. "The lessons that come out of Aruba's microgrid operations will be valued at all levels of the country, and it's something you'd look to replicate across all islands in the Caribbean and beyond, and not just at the local level." At the U.N. sustainability conference, CWR founder Sir Richard Branson joked that his private island would beat Aruba to the 100 percent renewable goal. The business magnate's property in the British Virgin Islands, Necker Island, is much smaller than Aruba and doesn't have the same societal complexities that a country does, but in trying to reach Branson's goal, it could spearhead solutions that benefit Aruba and other nations. Earlier this year, CWR held a request for proposals for the provision of renewable energy and energy services on Necker Island. Winning bids will be announced before the end of the year, and shovels should be in the ground by spring, Doolub said. "We recognize that islands on their own aren't necessarily going to result in gigaton-scale carbon reductions, but, actually, there is an economic and environmental and social benefit to this transition [to renewable energy]," she said. "So for us, islands are the perfect place to demonstrate low-carbon pathways in terms of showcasing to the rest of the world why and how this works." Aruba joined in the challenge and has since pledged to become the first nation powered 100 percent by renewable energy. Sir Richard Branson, the man behind Virgin Group and founder of the Carbon War Room, also committed to making his own private island in the British Virgins run almost entirely, if not completely, on renewable sources. Microgrids will be a key enabling technology in reaching those goals. Broadly defined, microgrids are smart networks capable of aggregating and optimizing diverse sets of distributed energy resources and operating in "island mode," engineer lingo for functioning apart from the central power grid. Physical islands are ideal laboratories for these systems because they're geographically confined and often have no existing grid network. They are generally also rich in renewable resources, yet rely almost entirely on diesel fuel. Diesel is an effective energy source, but also a problematic one. According to the World Health Organization, diesel exhaust contains toxins that can cause cancer in humans. It's also more carbon-intensive than regular gasoline and natural gas, and older generators can emit large amounts of particulate matter. What's more, it is cripplingly expensive. The cost of diesel, which is tied to the price of oil, is highly variable and increasing. In contrast, production prices for renewable energy and energy storage technologies are declining. The most efficient islands running on diesel energy pay around 40 cents per kilowatt-hour, according to Jigar Shah, clean-tech consultant and board member of the Carbon War Room. Less efficient ones pay closer to 70 cents per kWh. The monthly average retail price of electricity in New York state, home to some of the highest rates in the country, ranges between 16 and 20 cents per kWh. "I think it's no secret that island nations are struggling under the cost of oil at $100 per barrel when their primary level fuel is coming from diesel," Shah said. "So I think it's quite clear that climate change solutions like solar, wind, gasified biomass and waste energy and other technologies can really be more cost-effective [on islands] than diesel today." Where tricky fuel delivery logistics are involved, the business case is even stronger. For the small island of Graciosa, off the coast of Portugal, diesel fuel is shipped in from the mainland via a larger Azorean island. This arrangement makes Graciosa's 4,500 inhabitants vulnerable not only to price fluctuations but also to fuel supply constraints, which could be triggered by the increasingly frequent and severe storms scientists expect will come with climate change. If the fuel barge doesn't show up, the island is basically out of luck. "Right now, a diesel tanker has to dock at Graciosa every week. So if they have a storm and they can't land for three weeks, they have a bit of a problem," said Philip Hiersemenzel, spokesman for the German energy project and development company Younicos AG. Younicos, which has a company slogan that reads "let the fossils rest in peace," is developing one of the first-ever commercial-scale island microgrids on Graciosa. The aim is to meet 70 percent of the island's annual energy needs with renewables. Simply installing wind and solar power plants will not get there, so long as the island relies on a diesel generator to stabilize the load, Björn Lang, technical sales manager at Younicos, explained. That's because the generator always has to run at at least 50 percent capacity, no matter how much the wind is blowing or sun is shining. So the only way to meet Graciosa's goal is to turn the diesel generator off completely for stretches of time. Youncios plans to achieve this by combining advanced energy management software with a 5.4-megawatt wind park, a 500 KW photovoltaic solar array and a 2.5 MW hybrid lithium-ion and sodium sulfur battery. The Graciosa utility, Electricidade dos Açores, has already signed a power purchase agreement with Younicos to build out the microgrid. Now in the final stretch of securing investors, the project is expected to break ground in 2014 and be complete less than two years later. Island microgrids present a big opportunity to transition off fossil fuels. Approximately 11 percent of the world population lives on islands where there is very limited access to energy and a huge growth in demand, like in Indonesia and Philippines. Using solar panels, this homeowner made a new entry into a world without diesel-driven electricity. Companies like SMA, General Electric Co., Siemens Corp. and Lockheed Martin Corp. that are developing microgrid technologies stand to make considerable profit from these projects. Consulting firm Navigant Research forecasts revenue from the deployment of microgrids worldwide to rise from $10 billion in 2013 to $40 billion annually by 2020. Worldwide revenue from the deployment of remote micogrids will grow from 3.1 billion in 2013 to 8.4 billion in 2020, according to the research firm. "People are not tinkering. People have already spent tens of millions of dollars buying companies, integrating technologies and hiring the right staff," Shah said. "This is not a small opportunity. People are looking at this as very much commercial," he added. Microgrids with an "islanding" capacity need not be surrounded by water. They are also well-suited for locations on the mainland where it is too costly and inefficient to deliver power from the central grid. By 2020, the International Energy Agency (IEA) estimates that developing countries will need to double their electrical power output. This growth in demand will outstrip the expansion rate of conventional electricity grids, according to Navigant Research. In a recent report, the research firm said it expects the majority of new power supplies will be produced and distributed via remote microgrids and other forms of distributed energy. By enabling the use of renewable energy, microgrids will theoretically slow down the onset of climate change, said Peter Asmus, senior analyst at Navigant. According to the United Nations, they will mitigate against energy poverty at the same time by bringing clean energy to communities that currently have no power. Technologies being developed on Kythnos, Graciosa and elsewhere not only will help islands thrive, but will help countries around the world leapfrog national grid systems to a future of smaller, cleaner, self-sustaining grids. "Islands are pioneering the smart grid solutions for managing the variability of renewables, which really isn't an issue at low penetration, but is a huge issue at high penetration," said Lilienthal of Homer Energy. "It's a solvable issue, however, and the islands are the ones showing the way."